Some of Jan's notes from home have been shorter than others. This one, while brief, still managed to say all that needed to be said. You might remember that Bella had "discovered" an old stuffie toy that belonged to my Lab, Beau. 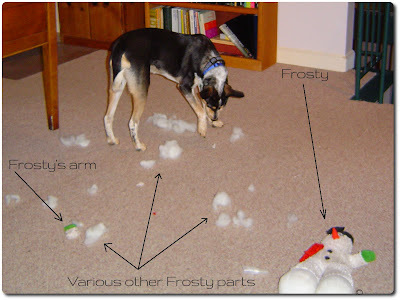 For those of you who might have pondered Frosty's fate, I give you the latest installment of "Notes from home". He'll be back. But, LOL!! My lounge room usually looks a lot worse than that. There is always a stuffie in some stage of dismembering. Frankie should have been a butcher! Oops! :) Yeah, we can't give our boys stuffies of any kind. It would be like offering them up for sacrifice. LOL - Oh Frankie! Too bad Bella and Frankie will never meet - I think she'd like him very much. As for the destruction, we were caught quite unaware - my Beau had these toys for years and while they were always in his mouth, he never really damaged them. Oops! LOL Elizabeth - that's too funny. I tell ya', I started buying them 5 for $1 because she just shredded them in seconds! I have found a few toys she hasn't been able to destroy but she doesn't like playing with them - doh! I guess the fun is in the destruction.